Since the first edition of this manual published in 1962, it has long been a standard reference for veteran pilots preparing for the commercial knowledge and flight tests. The Commercial license preparation manual from Kershner's "The Flight Manuals Series." Updated and edited by his son William C. Kershner. 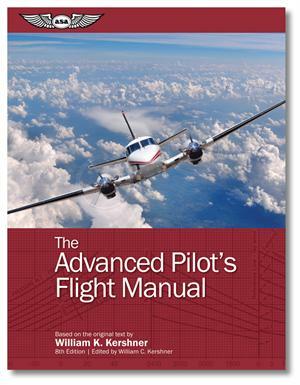 The Advanced Pilot’s Flight Manual has long been a standard reference for pilots transitioning to advanced models and types and preparing for the Commercial Pilot knowledge and flight tests. This book bridges the gap between theory and practical application, covering the fundamentals of airplane aerodynamics and aircraft performance. Rules of thumb are used throughout as a means of presenting a clearer picture of the recommended performance parameters, and increasing understanding of the variable factors that affect aircraft operations such as altitude and temperature. Knowledge of these thumb rules will enable pilots to maximize performance when operating faster aircraft and at higher altitudes.